We are very excited to share this project with you, and even more excited to have finished it! Our backyard has been an ongoing project since last summer. We had a huge wave of inspiration after being in Tulum earlier this summer. We decided that we wanted to recreate a lot of the great things we saw in Tulum in our own backyard. 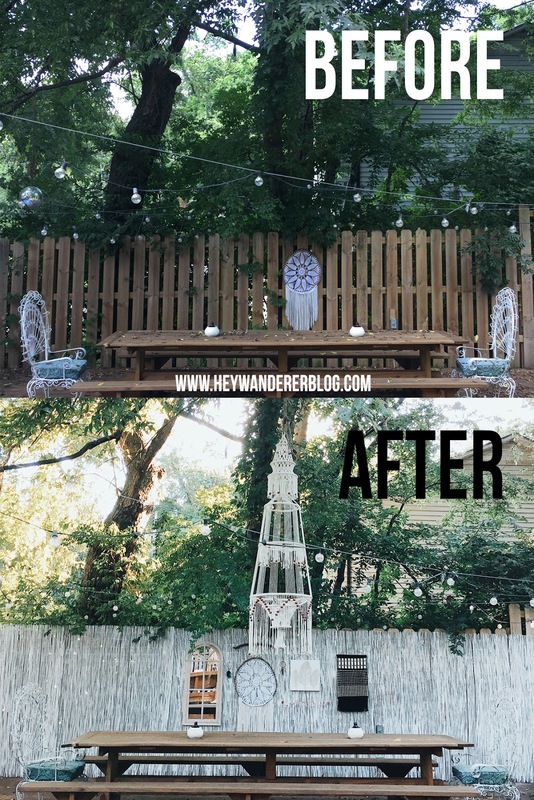 The deck in our backyard is very large, so we have a few different spaces that we are able to decorate. It has been interesting to figure out how to utilize the space properly. After Tulum, the first thing we knew we wanted to do was add white. Our stained deck is a LOT of wood (which we love) but as we add more wood things, like the stock tank pool bench, we knew we'd want to paint them white. This project was really so simple. You don't even have to add decorations. A white bamboo fence and some globe lights would really add something to a space. I will say that some sort of macrame piece hanging in the tree really took it up a notch. It's definitely something worth looking into, just make sure you scotch guard it really well! Thanks so much for checking out our project! If you like this sort of thing, make sure you subscribe to our channel on YouTube and follow us on Instagram for real time stories. See you next time! Omg this looks amazing! I love everything about it! 5 Tips for Summer "Me Time"